US South | What are Buddhists building in Berry Hill? A new temple. Construction is underway on a new Tibetan Buddhist temple in Davidson County. 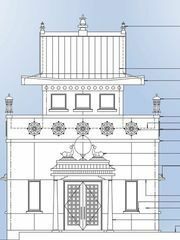 Berry Hill, TN (USA) -- The Padmasambhava Buddhist Center of Tennessee is adding the small, 600-square-foot meditation hall called the Yeshe Tsogyal Temple at its Berry Hill location, said Dolly Carlisle, a board member for the the center. "It's really going to be quite unique," Carlisle said. "It's small and intimate, but the whole focus of Tibetan Buddhism is to create harmony and peacefulness and tranquility." The new, white stucco and red-trimmed temple with its Tibetan-style cupola helps fulfill the vision of the meditation masters connected to the center, Carlisle said. Venerable Khenpo Tsewang Dongyal Rinpoche and his late brother, Venerable Khenchen Palden Rinpoche, began visiting Middle Tennessee in the 1980s at the invitation of local Buddhists and those exploring the religion, Carlisle said. The brothers kept coming back and had a vision of having a learning center in Nashville, she said. Khenpo Rinpoche is providing guidance on the new temple in Berry Hill. "They really loved Nashville," Carlisle said. "I don't think we could have done it if we were just a group of people thinking, 'Oh, we need to build a meditation center,' because their vision was so precise." How many Buddhists are in Tennessee? The brothers taught in India for nearly two decades before moving to the U.S. in the 1980s. Today, Khenpo Rinpoche now oversees a 500-acre monastery and education center in New York state. There are more than 20 Padmasambhava Buddhist Center chapters in the U.S. and beyond. While its one of the largest religions in the world, Buddhism only has a small presence in Tennessee. In 2014, one percent of the state's adults identified as Buddhists, Pew Research Center shows. Today, the Tibetan Buddhist center in Berry Hill has about 100 members and roughly half regularly participate in the practices, Carlisle said. Its number of spiritual adherents has remained steady, but the center has seen an impact from society's increased interest in meditation, she said. "There's actually a great deal of interest now in, particularly, mindfulness meditation. For us, it's a spiritual undertaking," Carlisle said. "People know that mindfulness meditation is good for your health." The organization plans to offer meditation classes to the public, she said. The temple, expected to be completed later this year, is the featured focal point of a Buddhist center. Its construction is a part of a $525,000 renovation project of the East Iris Drive site. The organization bought the property in 2005 and practiced in a converted house until construction started last year. As of the end of January, the organization still needed to raise about $30,000 to complete the project. The money will be used to finish the temple's interior and complete the gardens. For more information, visit the center's website at http://pbc-tn.org.